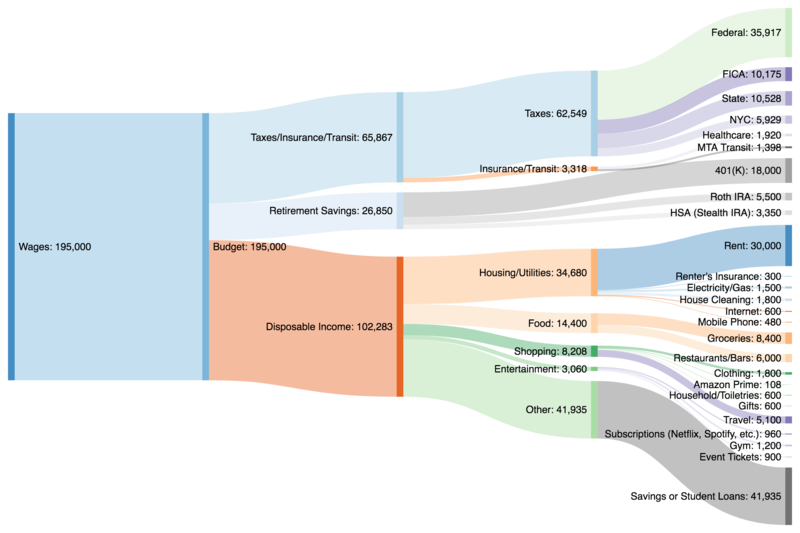 Charts and images can help you better understand where your money is going and identify what the biggest chunks are assigned too. Let's look back at that first year associate sample and see if it changes your outlook. Sometimes I need something visual to fully comprehend what’s happening. That’s why I took one of the site’s most popular posts, Sample Budget: 1st Year Associate, and created a visual flowchart so we could get a bird’s eye view of the outflows (click for bigger image). I know this might not be YOUR budget but I think the exercise applies to all lawyers. If there’s interest, I’m happy to make additional ones to illustrate different salaries. It should be obvious to anyone glancing at the flowchart, but taxes are by far your greatest annual expense. That big fat top line is a flashing red light. It should immediately grab your attention. Of course, taxes are mandatory. But while you can’t escape them, anything that commands such a large part of your annual expenditures is ripe for optimizing. Many people don’t fully understand that the tax code is the government’s single most powerful public policy tool. By adding tax breaks for certain actions and penalizing others, the tax code has a huge hand in shaping public behavior. You can either fight the government (and pay higher taxes) or take advantage of the opportunity and do what the government wants you to do (and save money). What’s an example? Well, the government wants you to save enough money to retire. It understands that a poor, broken 70-year-old lawyer without any retirement savings is a problem for society. That lawyer will probably cost the government thousands of dollars in social services. To avoid having to dole out money on your behalf, the government offers you a great deal to save in a 401(k) or other tax-protected account. You can either follow their lead and get richer or you can choose to use the money for another purpose. It’s entirely up to you! But once you understand that taxes are simply public policy, you can start to work the tax code to your advantage. Keep in mind that the sample budget I presented is already optimized for taxes. No 401(k)? No Health Savings Account? Couldn’t be bothered to sign up for the transit program to pay for passes with pre-tax dollars? Congratulations, you now owe another $9,326 in taxes. On the other hand, if you’re willing to play the game you can cut years off of your mandatory working life by taking advantages of the government incentives. I bet a lot of people will look at this flowchart and think $30,000 in rent a year? Yeah right, that’s not me. But $30K in rent is only $2,500 a month. That gets you a 1 bedroom apartment in the Upper East Side with an eat-in kitchen. It’s getting harder and harder for lawyers in NYC to stay within a $2,500 monthly budget if they want their own apartment. If you can swing a two bedroom share and save $1,000 a month, that’s $12,000 post-tax in your pocket each year. It’s hard to argue that $12,000 isn’t a significant sum of money during your first couple of years of practice. Of course it’s not an either/or proposition. Housing is many shades of gray as you decide what makes sense for me. Just keep in mind that lifestyle inflation generally only works in one direction. It’s incredibly hard to downsize, so pay special attention to whatever you set as your “base” housing expectations. It’s okay to start small (or with roommates) and slowly upgrade your lifestyle over time rather than doing it all at once. If you get an apartment that is $300 more expensive than your budget, it’s unlikely to be just a $300 X 12 month expense, as you’ve now set the floor for everything going forward. The housing allowance also highlights the great deal you can get if you are paid Biglaw money in a place like Texas or Chicago. Don’t fritter away your opportunity on a 3 bedroom 3 bath 2000+ sq ft home you don’t need when you can be out of debt well before your San Francisco friends. What if you’re not in Biglaw or a government lawyer with a six figure salary? You may not have as much wiggle room (to say the least) but I bet housing is still a significant expense that needs to be considered. You’re much more likely to leave a high cost-of-living location like NYC/SF for a more affordable market like Nashville or Portland, particularly if your salary will not fluctuate. You also probably noticed that the “other” category is a pretty thick line too. This isn’t a frugal budget by any stretch, so it’s nice to see that you have a solid tool for either paying off your student loans or saving more money. If you’re doing it right, this “other” category is your floor going forward. By setting up your accounts in a certain way, you can bank your raises without the risk of lifestyle inflation. A third-year associate would see their “other” category jump an additional $38,350 thanks to salary increases and a bigger bonus. If you can’t build wealth following this strategy, I don’t know what would work! Let’s talk about it. What did you notice in the visual flowchart?